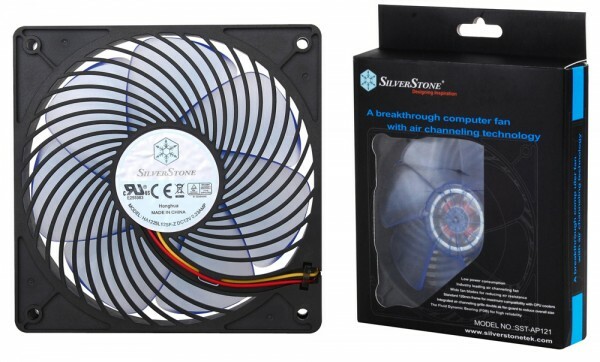 SilverStone today released their new “Air Penetrator (AP)” series of fans aimed at high end computer cooling. The AP line of fans is significant due to their new methodology of cooling. Most computer fans exhaust air outward in a vortex-like spread. This reduces overall efficiency according to SilverStone, so they’ve designed the AP line of fans to focus the air in a column. This method improves airflow by directing more air to the components that need it, and reduces multiple airflows from conflicting with one another. To achieve this column of cool air, SilverStone has applied two new techniques to their fans: large and wide overlapping fan blades and an opposite-spin fan grille. The large fan blades increase the static pressure of the fan, allowing it to push air further, which is especially helpful when these fans are put on a restriction such as a dust filter or radiator. An opposite-spin fan grille helps direct the airflow in a column, reducing the spread. This technique is most commonly used on high-end household fans such as the Vornado and Honeywell air circulator fans. SilverStone says that these two features make a great combination for an unbeatable intake fan. Currently, SilverStone has two models in the AP series, the AP121 120mm fan and the AP181 180mm fan. The AP121 utilizes a fluid-dynamic bearing for robustness spinning at 1500rpm and is rated to move 35.36CFM of air at 22dBA. The AP181 utilizes a sleeve bearing design and can run between 700rpm and 1200rpm, moving between 80CFM and 130CFM. The sleeve bearing on the AP181 is an improved design, and thus allows for all mounting positions while still retaining a silence between 18dBA and 34dBA. We’re very interested in the AP line of fans at Skatter Tech, as Scythe’s “Gentle Typhoon” line of 120mm fans have been dominating the PC cooling scene. In particular, the AP181 fan improves the sparse range of 180mm fans available on the market, and offers an intriguing upgrade to owners of SilverStone’s Raven and Fortress line of cases. Pricing hasn’t been released, but I’d expect the AP121 to sell for under $15 and the AP181 for under $35.